Europa: Possible geyser observed using Hubble. 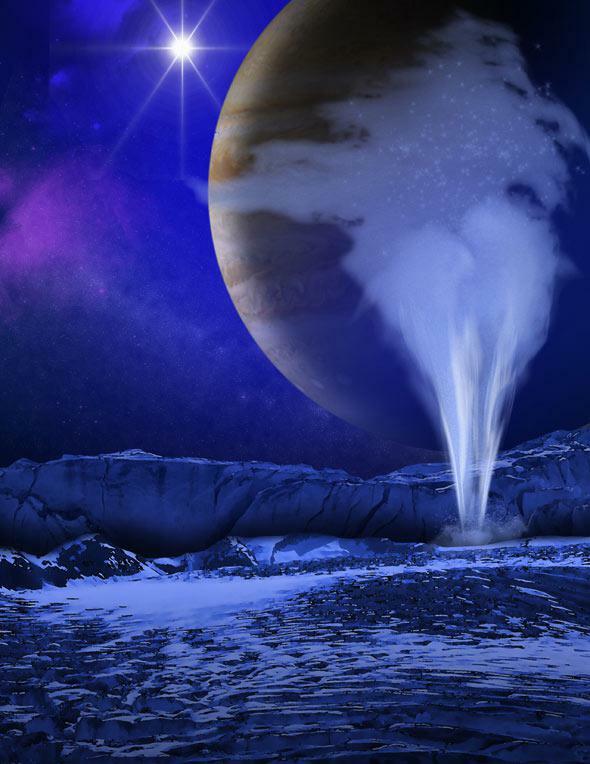 Artwork depicting a towering geyser of water erupting from the south pole of Jupiter’s moon Europa. Click to arthurcclarkenate. Using the Hubble Space Telescope, astronomers have seen evidence of a massive geyser of water erupting from the surface of Jupiter’s icy moon Europa. This plume of water extends as high as 200 kilometers (about 125 miles) above the surface. This is pretty amazing news. 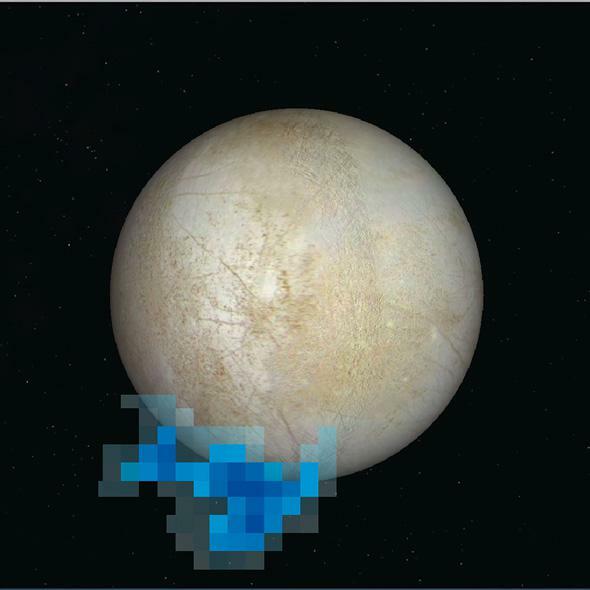 We’ve known for a while that Europa has liquid water under its surface, but this is the first direct evidence of it. Not only that, it changes how we think the water and surface interact. It’s hard to say whether this makes it more likely that there are little Europan fishies swimming around down there, but it does mean it’ll be easier to take a look. First, a bit about the moon itself. Europa’s roughly the same size as our own Moon, and very bright (you can see it easily with binoculars). Its surface is very reflective, so we’ve been pretty sure for some time it’s icy. Probes sent to Jupiter (like Voyagers 1 and 2 and Galileo) confirmed this; detailed images of the moon show it has very few craters (indicating it resurfaces itself), there are wide and long cracks extending over its surface, and honestly it just looks like there are ice floes pushing and jostling against each other. Europa’s orbit around Jupiter is slightly elliptical. When it’s closer to the gigantic planet, it feels more stress from its gravity, and when it’s farther away, that stress is relieved. It also gets strained as the other big moons pass it in their orbits as well. All of this squeezing has heated up the interior of Europa, melting the ice. The surface is actually the top of a shell of ice floating over an undersurface ocean. We don’t know how thick that shell is … but we estimate that Europa has more water on it than Earth does in its oceans! And at least some of that water has a means of getting up to the surface. An image of Europa with the observations from Hubble superposed, showing where ultraviolet light was seen. Click to embiggen. The geysers were discovered in observations from the Hubble Space Telescope (using, I’ll note with pride, the Space Telescope Imaging Spectrograph, a camera I worked on for several years). Looking at ultraviolet light from Europa, a “hot spot” was seen near the moon’s south pole. The exact wavelengths (colors) of the light showed that this bright spot was loaded with both hydrogen and oxygen—the constituent atoms in water. The idea is that water erupting from Europa is exposed to space (Europa has no atmosphere). Jupiter has a ridiculously intense magnetic field, and electrons caught in that field are accelerated to high speed. These electrons slam into the water molecules from Europa, breaking them up into individual atoms of hydrogen and oxygen, which then reveal their presence by glowing in the ultraviolet. Interestingly, earlier observations showed no trace of this light, and that actually supports the idea that this light is from a geyser. Why? Those older observations were taken when Europa was close to Jupiter, but the new observations were taken when Europa was farther away. This is critical: When the moon is close to Jupiter, the squeezing from the planet’s gravity is maximized, and when it’s farther away the squeezing is lowered. This means that any deep cracks in the surface are squeezed closed when Europa is near Jupiter and relaxed, opened up, when it’s farther away. If water from the subsurface ocean were to escape through cracks, it would be when they’re open. So these observations precisely fit the idea that this is what we’re seeing. We need more observations of this to confirm it, but the data taken are extremely compelling, and a geyser of water erupting from the surface is the simplest explanation. How much water are we talking about here? Given the amount of hydrogen and oxygen seen, the scientists estimate that a staggering 7 tons of water are erupting from this geyser every second. The force behind the eruption is huge: The plume reaches 200 km (about 125 miles) high, with the water screaming out at 700 meters per second—more than 1,500 miles per hour, three times faster than a passenger jet! 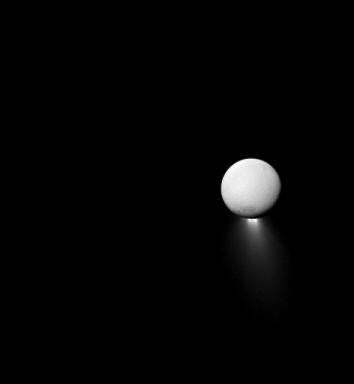 As it happens, we know of another moon with geysers: Saturn’s moon Enceladus. Europa is much larger than Enceladus (3,100 km versus 500 km) and so has much stronger gravity. That means that for a given speed for the water, the plume won’t stretch as high on Europa as it would on Enceladus. Still, it’s worth comparing. On Enceladus, the plumes are higher, reaching 500 km (about 310 miles) off the surface, move more slowly at 300–500 meters per second (700–1,100 mph), and only out pump about 200 kilograms (about 450 pounds) of water per second. Because of Enceladus’ lower gravity, some of that material escapes from the moon into space. 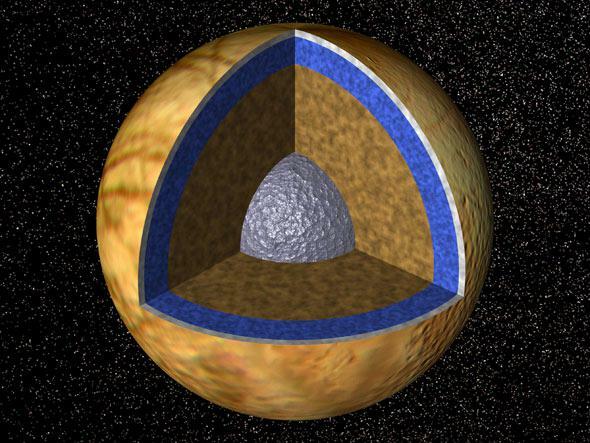 For Europa, with its stronger gravity, the material falls back to the surface where it freezes. The geysers on Enceladus are also at the moon’s south pole—stress from Saturn’s gravity is strongest there, just as stress from Jupiter is strongest at Europa’s poles—and dozens have been found along long cracks colloquially called tiger stripes. The Cassini spacecraft has been orbiting Saturn for nearly a decade, and we have fantastic high-resolution images of Enceladus, allowing us to identify the regions in the cracks where the geysers originate. With Europa, we don’t have the same sort of maps. This may be one plume or many close together. We most likely won’t know for some time, until we can get more spacecraft orbiting Jupiter once again (like the planned ESA Jupiter Icy Moons Explorer mission). Of course, this naturally brings up the question of life. Water is a great molecule if you want to live: It stays liquid across a broad range of temperatures, lots of things dissolve in it (making it a good vehicle to transport nutrients), it can protect fragile biological molecules from harsh radiation (which is abundant near Jupiter), and more. For life as we know it, water is the elixir needed. So just the presence of water under Europa’s surface is exciting. But life also needs energy, and it needs raw materials. The fact that these geysers exist shows that plenty of energy is being pumped into the moon; it takes substantial power to blast water that high off the surface. It also indicates the surface and the ocean underneath interact with each other, which means raw material for life are available. Jupiter’s fierce magnetic field produces radiation, which reacts with molecules on the surface of Europa to create simple organic compounds. We also think such material has been brought to the moon by asteroid and comet impacts over the ages. If this stuff can get to the water underneath, then we have all the necessary ingredients for life to arise. Also, these geysers have a more direct impact on us as well: This means the water is more easily accessible from the surface. If we want to explore Europa’s ocean and look for life, we have to get to that water, which means drilling or melting our way down through what could be a shell of rock-hard ice kilometers thick. But now we know there is a pre-existing path to that ocean. Any probe we send can take advantage of that and save a lot of effort. It could even sample the water that gets to the surface without having to get underneath it at all. One of the defining goals of our human curiosity is trying to find out if we are alone. We’re just now starting to get a handle on that, finding planets around other stars, understanding the chemistry and conditions needed for life to arise, having the actual ability to go and search the nearby worlds around us. Our endeavors to explore the Universe, find our place in it, and seek out life are among the noblest and most exciting things we humans do. And now our odds of this have gone up. Slightly, perhaps, but I’ll take it. Mars is close by, relatively speaking, and we know it once had liquid water on it. We don’t know if it still does, but if life ever existed there, it may have been long ago. Enceladus has liquid water, but it’s much farther away. That means it takes longer to get there, and it’s harder to launch the heavier equipment needed to analyze it. Europa is closer. It’s not exactly around the corner, but still well within our grasp. If these observations of a geyser on this moon are verified, then we have another juicy target at which we can aim our curiosity. I want to explore all these worlds, our solar system from inside out, but Europa just moved up a notch or two on the list. Not long ago, a trip to Europa was firmly in the territory of science fiction. In a few years, it may have to transition to the textbooks.